These Stuffed Red Velvet Cookies are similar to a Whoopie cookie. A cake mix helps make the quick and easy! Welcome! This is Diane from Recipes for our Daily Bread. I look forward to sharing my easy recipes with Princess Pinky Girl followers every month. If you plan to bake any cookies this Christmas and need an easy, delicious cookie recipe, you will love these Stuffed Red Velvet Cookies. 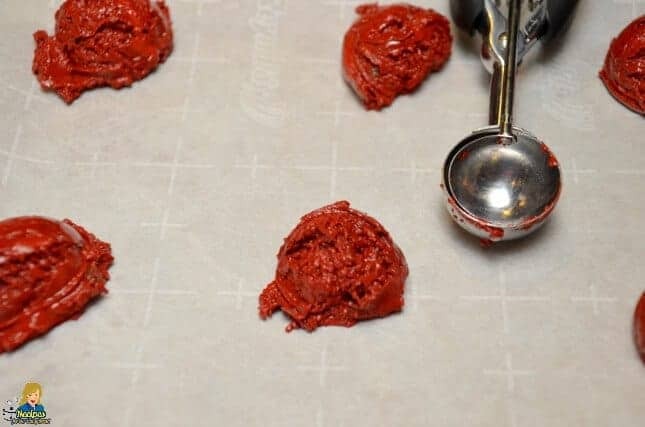 What ingredients do you need to make these Red Velvet cookies? A simple Red Velvet cake mix is used for the cookie. Have you ever made cookies from a box of cake mix? Cake mix cookies are soft and chewy and super delicious (check out Princess Pinky Girls Cake Mix Cookies – great for any occasion)! 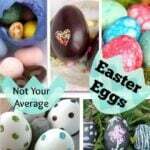 Plus, they only require three ingredients to make the cookies including cake mix, vegetable oil, and eggs. 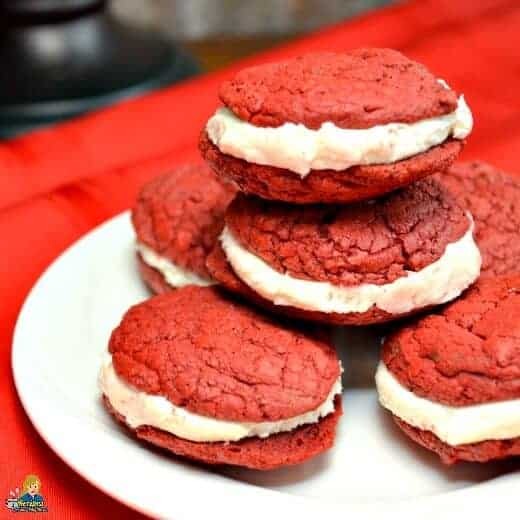 To kick up these delicious Red Velvet cake mix cookies, I stuffed them with a fantastic cream cheese filling. The stuffing is made from cream cheese, marshmallow creme, confectioners’ sugar, butter and a little shortening. We make these cookies often at my house. I use different cakes mixes and even color the filling for various times of the year. You can see my Devil’s Food Stuffed Cookies here. Whip up these Devil’s Food Stuffed Cookies at the last-minute and impress everyone. Because these cookies are red and white, they are perfect for the holidays. If you need cookies for a Cookie Swap or your children’s class, kids will love these cookies are stuffed. They have not one but two cookies sandwich together with the fantastic creamy filling. Mix all the ingredients together using an electric mixer. I use a small ice cream scoop, 1 TB size to scoop the cookies on a baking sheet. Because of putting two cookies together, I prefer using the smaller scoop. Use an electric mixer and beat the marshmallow creme, butter, shortening, and cream cheese until fluffy. Spread the filling on the bottoms of half of the cookies. Top each with another cookie. Thanks for sharing my Red Velvet Stuffed Cookies. 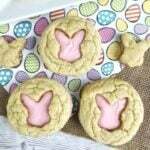 They are one of my personal favorite cookies because they are so easy to make and YUMMY! These look absolutely divine. Have you ever tried adding more brown sugar to make the cookies a bit more dense? I love red velvet cake, but I prefer my cookies to have a bit more crunch. Might just have to give it a try. Thanks for sharing the recipe. I am a little confused about how to make red velvet cookies from devil’s food cake mix. Did you mean red velvet cake mix? OMGosh – I cannot believe you are the first to notice it! Yes, it should read RED VELVET – changed and THANK YOU!! !